Kākoʻo ʻŌiwi » Our New Weather Station! Check out our newest addition to the farm! 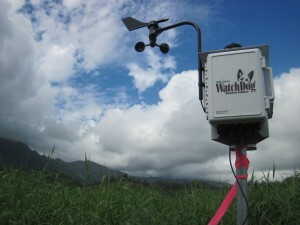 This Watch Dog weather station was installed two weeks ago,courtesy of University of Hawaii researchers, Henrietta Dulaiova and Gabrielle Weiss. This station will help us track the weather patterns occurring directly on our site, while providing important data for the Hydrology and Geography Departments at UH. As Henrietta and Gabi attempt to map our stream source and analyze how rainwater influences the stream flow. As our partnership with the University of Hawaii continues, we look forward to sharing data and analysis with all of the researchers who study at our site. Mahalo again Henrietta and Gabi!